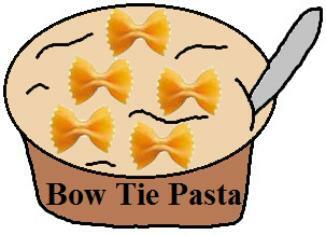 Cook bowtie pasta to the al dente stage and drain well on paper towels. Mix cornmeal and favorite seasoning mix. Toss the pasta in the cornmeal/seasoning mix. Deep fry the coated pasta until golden brown. Drain and serve. Use this with the Blest Be That Tie That Binds Sunday school lesson.